The following is a self- interview by Lisa Nelson originally published in ballettanz, April 06 as “Composition, Communication, and the Sense of Imagination: Lisa Nelson on her pre-technique of dance, the Tuning Scores.” It was featured in Critical Correspondence exactly 11 years ago. It is now rescued from the archives, as we wanted to have it in dialogue with the conversation between Nelson, Steve Paxton, Megan Bridge and Beau Hancock, also featured this month. Laboratory: Tuning Scores—Composition, Communication, and the Sense of Imagination. This research focuses on the physical base of the imagination. As dance is the medium of my study, I will offer physical practices that put questions on the table. By altering the way we use our senses while moving and watching movement, we can identify the genetic, cultural and idiosyncratic movement patterns our senses use to read our environment and contribute to constructing our experience. These patterns both inform our desire for action and what we perceive when we are attending to anything. Practices include tuning the senses (vision, hearing, touch, kinesthesia, intuition) to follow features in both the “inner” and “outer” environments; sensing and measuring stillness and movement through each of the senses; and shifting from sense to sense and sensing to action, activities we engage in every waking moment. Fueling this research is the perception of the body as both proscenium and performer, as container and generator of imagery, as thought and feeling. Beginning with the composition of the body—our home, spaceship, time capsule. An organization of biological matter (skin, bones, muscles, eyes, brain, water…) and experience: memory, desire, feeling, imagination, expectation, opinion, perceived environment, movement. These contents are compositions in themselves. Try: body as the container, the environment, of the imagination, and vice versa. Intention and attention are agents of the body’s changing composure. Composition: organization, perception, patterns, meaning. How does “composition” arise? Is design a surface value? Tuning practices are a pre-technique: maps to follow with feedback systems to help one observe one’s patterns, process, strategies and appetite for becoming physicalized, i.e., awake, alert and available to dance. Also, a tool to taste ones creative body before doing formalized technical practice like ballet, tap dance, contact improvisation, flamenco, yoga, what-have-you. Tuning Scores are an application of the practices. In looking for improvisational systems that could encompass the particularities of the choreographic craft and still remain spontaneous and co-directed, I devised the Tuning Scores. They call on everything one knows, combining the discipline of observation with the art and craft of memory: keys to the art of improvisational dance as I know it. The Tuning Scores provoke spontaneous compositions that make evident how we sense and make sense of movement, exposing our opinions about space, time, action, and desire, and provide a framework for communication and feedback amongst the players. The scores draw from genetic and acquired skills of survival: how we look at things, what we “need to know,” the perceptual process of editing spontaneously in order to make meaning out of any moment. With the scores, we play with our desire to compose experience, to make our imaginations visible, to develop a sense of ensemble, and to transform our movement into dancing. What are the sources for my work? My first source was the experience of shifting disciplines from dance to portable video in 1974. By teaching myself a new medium (and by chance, teaching others at the same time), I was able to track my own peculiar learning process and discover the sense of vision and the profound part it plays in the act of dancing. Chronologically, my next source was the psychologist/philosopher J.J. Gibson who first suggested the “ecology of perception” in his book, The Senses Considered as Perceptual Systems (1966). His title suggests a mosaic of behaviors that underlie our movement. Gibson observes the movement of the body and the sensory organs from a functional viewpoint, as both exploratory and performatory. He examines the physiology of the multi-sensorial activities of looking, listening and touching. Through this lens, he revisions the basic orienting/vestibular system, auditory system, haptic/somatic system, tasting and smelling, and the visual system. Gibson's creative dialogue between physiological investigation and experiential inquiry set his book somewhere between a text book, a workbook, and a live performance. The latter, because the basis of his theory of perception unites the observer and the observed, and he unravels his ideas from concepts of awareness and attention, concepts that appear in any serious discourse about the craft of dance improvisation, construction, and performance. His direct observations of physical behavior and open spirit of inquiry led me to look at the role of the exploratory behaviors of our senses in shaping our opinions or aesthetic appetites regarding how we move and what we see when we’re looking at dancing. This stimulated my construction of myriad scores and explorations of dance behavior which I’ve enfolded into my teaching and dancemaking. A third source is my study of the experiential anatomy of Body-Mind Centering with Bonnie Bainbridge Cohen beginning in 1977, which added the dimension of dialoguing body systems through an intuitive approach to a convincingly concrete and comprehensive analysis of anatomy from both Western and Eastern medical perspectives. What is the context of my teaching? By choice, I am an itinerant teacher. I pass through cultures, languages, dance behaviors, urban and rural environments. In relatively short bursts of a week to a month of intensive studio work, I offer my proposal to (sometimes mixed, sometimes homogenous) populations of dancers, dancemakers, movement enthusiasts and performing artists of many disciplines. Perhaps righteously, over the last decades, the development of improvisational dance practices and the deep body/mind investigations that have informed their little-seen applications to contemporary performance have happened outside of institutions. The freedom to follow my nose has been supported by dialogue with the relatively few dance artists who have taken this route, some translating their discoveries into pedagogies for technique, bodywork, improvisation or performance, all committed to a spirit of open exchange. Yet improvisational dance itself is an idea. It has no intrinsic substance, cannot put a picture in your head. It is descriptive of a methodology that has potentially as wide an application and manifestation as the word "choreography." As more dancers and audiences become interested in improvisational dance performance--a thing apart from technical trainings--it becomes crucial to resist over-defining it by institutionalizing its pedagogies without exposing the creative works, in their specificity, of individual artists who identify with their methodology. These are some of the external conditions that have shaped my approach and continually modify my aims as a teacher. What are my aims in teaching? Practically speaking, two things: To create a learning environment that is the essence of performance, and to unite dance and the performance of observation. 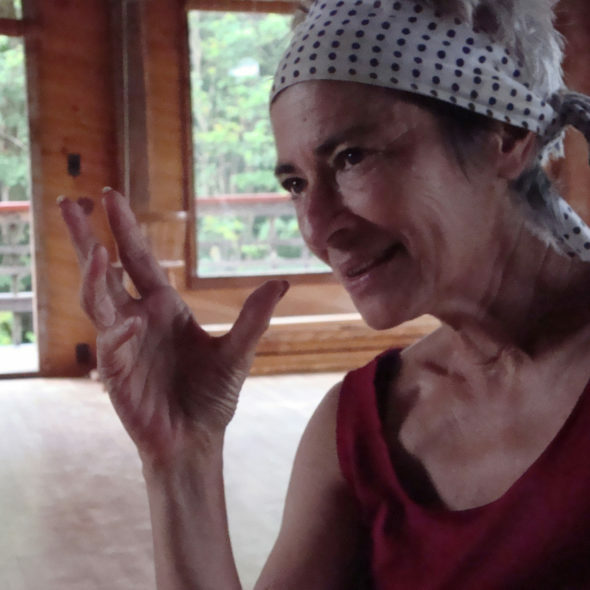 In order to make relatively short workshops meaningful in the long run, to offer internal dance practices that can continue outside of the studio, anywhere, at any time, and that can be applicable to the study of any artistic discipline. Idealistically, three: To energize the corner of the field of dance that values the art of movement, the particularities of movement and dance behavior, the details of human movement that are made invisible, edited out by our cultural conditioning, dance trainings and marketable Western concert dance. By loosening the bonds of perceptual conditioning in the relative safety of the dance studio, grounded in the play of the body, to revisit the magical world of the child, pre-naming, rendering responsibility and a more direct, flexible and compassionate construction of reality with which to face the challenges of our ailing planet. It is my hope that the spirit of dialogue that is at the root of improvisational efforts in dance will inspire action and individual initiative in pursuit of a life that is worth living, in the theater and out.